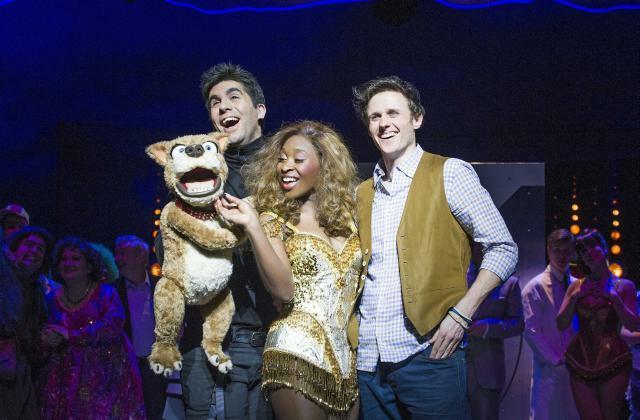 Simon Lipkin, Cynthia Erivo and Alan Morrissey. Photo by Tristram Kenton. Like so many X Factor contestants that have come before it, there are moments of I Can’t Sing! that are full of star quality, and moments that are utterly dreadful. First of all, the good. There are tons of hilarious moments, with the audience (and us) in prolonged bouts of hysterics. Harry Hill’s involvement is clearly evident, and if you’re a fan of his off-the-wall, bizarre comedy, you’ll love I Can’t Sing! The jokes are slapstick, silly and at times utterly ridiculous. When they work, which is most of the time, they work brilliantly. The character of The Wind delights all, although The Hunchback is perhaps a leap too far into the ridiculous. This is a big budget show, with some dazzling surprises from the set, including excellent use of projectors throughout. The whole production has the feel of a very slick pantomime, with clever pop cultural references. Puppeteer Simon Lipkin, who goes way beyond the limitations of his role, plays Barlow the dog spectacularly. You’ll also likely be moved by the heart-warming, tragic, yet comical back-story from the lead, Chenice, played superbly by Cynthia Erivo. Her story of an orphaned girl following her dream to study Alien Biology at the UFO Centre in Golders Green is unique to say the least. Erivo gives a show-stealing performance with Chenice’s first song – her star quality shining through magnificently. Whenever Erivo sings, the whole theatre lights up. Although she’s let down by a weaker song, Ecstasy, in the second half, she’s back on form with a variation of I Can’t Sing! at the end. We don’t meet the judges until the second act, and when we do, they’re disappointing caricatures of themselves. ‘Louis’ a decrepit old man, ‘Geordie’ a brain-dead Northern bimbo and ‘Simon’, an unstable, power-mad sociopath. Whether you think these sound like accurate portrayals of the judges or not, it makes for awkward viewing. Weak characters, especially compared to Chenice and her love interest and fellow contestant, plumber Max (Alan Morrissey). Aside from some hit or miss comedy, the production’s main pitfall is the weakness of its musical numbers. Most are instantly forgettable, aside from a few fantastic one-liners among the lyrics. Dermot O’Leary’s character 'Liam O’Deary' has one of the best, with I Love Hugging People I Don’t Know. If you’ve never seen the X Factor (which is possible, however unlikely, in a show that’s amassed audiences in the millions every year for over 10 years), a lot of the gags from I Can’t Sing! will go over your head. There are tons of in-jokes, about Louis Walsh, Dermot, Cheryl Cole and of course, the man himself, “Patron Saint Of Fame”, Simon Cowell. The progression of the story is predictable, and a bit disappointing after so much originality in the first half, but this is a musical about the X Factor – it’s obvious what’s going to happen. Probably the most ridiculous thing you’re likely to see in the West End this year, but if you’re an X Factor/Pop Culture fan, on the whole it will be a memorable and laughter-filled night out. I Can't Sing! is at the London Palladium, Argyll Street W1. Tickets £20-£65, booking until 25 October. For more information see the show website. Londonist saw this production on a complimentary press ticket.